You are here: Home / Before and After / Dyeing Pocket Charts Black: What NOT to do. And then more… of what not to do. I hate my blue pocket charts. Hate. They have never gone with my classroom colors, and this year, I happened upon this website via Pinterest which I thought just might change my life. Method #1: Dye Pocket Charts in the Washing Machine using RIT. I began by cutting the dowel rods out of the bottom of the pocket charts by making a small slit on the back of the chart to pull it out. This way, the pocket charts would be able to be washed around in the washer. Then, following the website directions to a T (and yes, my pocket charts are the “nice ones” which the website said was necessary…), I poured the whole bottle of RIT and 1 cup of Vinegar (I added vinegar to mine according to recommendations on the RIT packaging for dying nylon) into a washer full of hot water. I then added the pocket charts, agitated it for about an hour, and then let them sit overnight. The green chart actually had darkened quite a bit, but it was still obviously green (it kind of looks black in the picture but it is not), and the clear plastic now appeared to have little scratches or cracks in it- which probably happened in the washing machine. Method #2: Dye Pocket Charts on the stove using Jacquard iDye Poly. I have to say, this was looking promising. They were really looking dark. At the end of the hour, I turned off the heat and let them sit in the dye for another few hours for good measure. Then, I threw them in the washer with mild detergent and ran them through a few rinse cycles. I was like a kid on Christmas at this point, running up the washing machine to see my magical black charts! I did not scrunch it up like that- that is how it is-permanently. What happened was that the clear plastic (vinyl?) turned completely black, and the blue stayed.. well, .blue. Furthermore, the heat from the boiling water required to complete this method shrunk the vinyl and turned the charts into these scrunchy balls of ruin. Sad, sad day. And three completely useless pocket charts. Method #3: Make my own pocket chart?? With three ruined pocket charts, I’m looking into the option of sewing my own black chart. I’m still in the research phase- so I’ll get back to you on this one. Here is one great tutorial that I found on Artisen des Arts- I love her site! Why the powers that be don’t make pocket charts in colors other than primary, I’ll never understand! In the meantime, if you have a successful dyeing experience, PLEASE share! Carson-Dellosa is FINALLY releasing a BLACK calendar pocket chart! You can order one now on Amazon for $22.99. Our voices were heard! And here it is in my classroom! I was excited to see this post! I, too, hate that pocket charts only come in primary colors. It seems that if someone made pocket charts in colors other than navy blue, red, and green, they could make a fortune! My color scheme is black, white, and hot pink, and I was wanting to find a pocket chart in hot pink or black. I thought about spray painting a pocket chart black, but dying a pocket chart seems like a good idea. Thank you for sharing; now I know that dying a pocket chart is not something I want to try. I thought about spray painting too, but I wasn’t sure how to handle covering up all of the clear plastic parts without taking 10 years. If you try it, let me know! Yes, that, and forest green. They have no business being in a classroom! So thankful for this post! I had almost purchased the RIT dye. I hate my pocket charts. Last year I made blue one of m colors just for my sanity! It is a sad day when we have to design our classrooms around an ugly pocket chart just so it doesn’t stick out like a sore thumb! Perhaps we should start a petition for black pocket charts and send it to Carson-Dellosa? Who’s with me?! Glad I could entertain! That might be the most that comes out of this project! Which dye are you going to try? Definitely let me know how it turns out! A few years ago, I bought the small pocket charts that Target carried in black. Probably only about 18″ in width and 36″ in height….but it was black. If you are in need of pocket charts that hold files in fun colors, check out these! I scored some black ones when they were on sale for FIVE DOLLARS! They also come in some other fabulous colors! Thanks for the tip! They sure do have some cute file folders! This ti TOTALLY me right now! Which why with my stained hands I am typing this message. I too read the blog about the RIT and I too am failing miserable. I did however, find a black pocket chart ( a skinny long one) at http://www.mardel.com and its perfect! I hate my blue and green pocket charts. UGH! So sorry you are going through the misery as well! I did see the one at Mardel! Hopefully one day they make a calendar pocket chart and a daily schedule pocket chart as well! 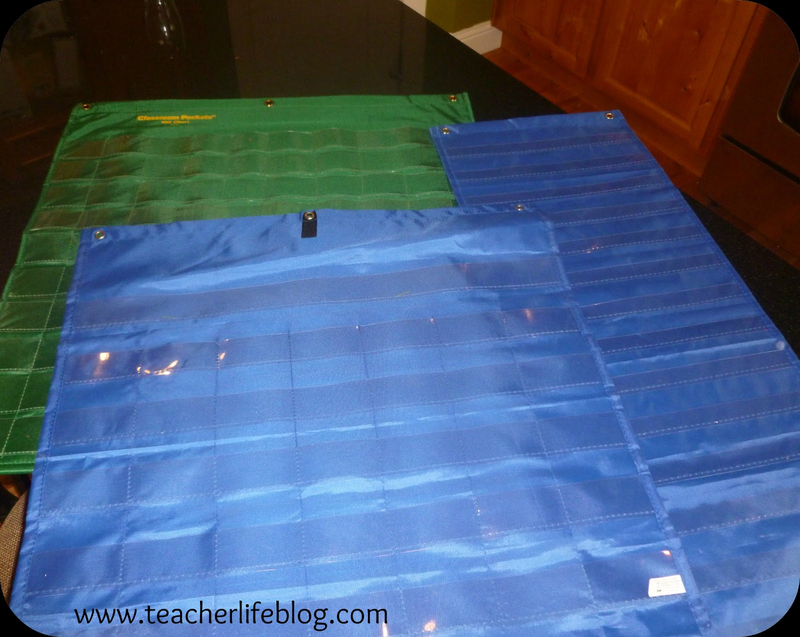 Buy The Ultimate Pocket Chart from Teacher Created Resources. Put any color paper or poster board inside for color (the charts are clear). They only come in once size, as far as I know. Does anyone know where to get pocket charts with pockets sized for photos? I HATE PRIMARY COLORS!! Dying did not work for me either. Spraying?! Not worth the mess. *I got small pocket organizers that are meant for photos as well as closet organizers both in black at Dollar Tree! *I use black over-the-door shoe organizers for multiple uses around the room. *Filetastic makes black file pockets you can order through Mardel. *Finally, I searched high & low for my calendar with no luck! BUT, while cleaning my summer clothes out of my closet & getting out my school clothes….I saw it!!!! My pretty b&w design HANGING JEWELRY POCKET ORGANIZER!! My new classroom calendar! !